A prominent administrator of the early Tokugawa shogunate, known as Chie Izu (知恵伊豆, “The Clever Izu”). Born to Ōkōchi Hisatsuna, a senior retainer of Tokugawa Ieyasu of modest background, Nobutsuna (松平信綱, 1596-1662) was adopted as the heir of his uncle, Matsudaira Masatsuna, in 1601. He was assigned to serve Tokugawa Iemitsu at the latter’s birth and remained his confidant throughout Iemitsu’s term as a shōgun (1623-51). 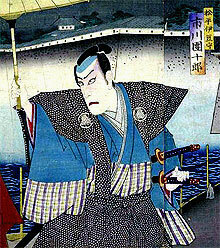 He served as a hatamoto and received the court title of Izu no Kami in 1623. In 1633, he was appointed daimyo of Oshi Domain (忍藩) in Musashi and became senior councillor (老中 rōjū), a position he would retain under the next shōgun, Tokugawa Ietsuna. 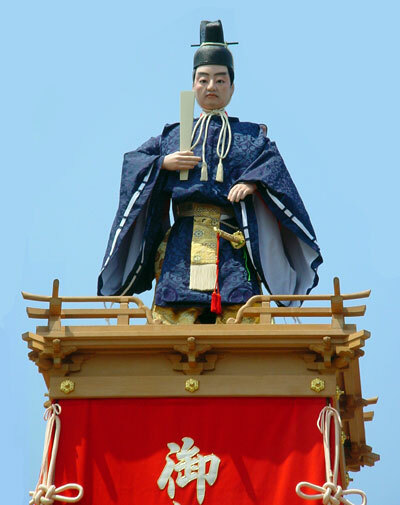 He is regarded as one of the principal architects of the shogunate’s administrative system. 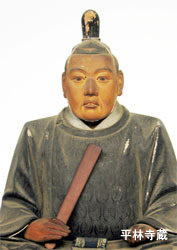 In 1637-38, he was in charge of suppressing the Shimabara Uprising, a rebellion of mostly Catholic peasants. In the wake of his inspection tour through those parts of Kyushu associated with Christianity and foreign contacts, he helped formulate the shogunate’s national seclusion policy in 1638-39. Nobutsuna also played a vital role in the discovery and the subsequent suppression of both, the Keian Incident (慶安事件 Keian Jiken) in 1651 and the Jōō Incident (承応事件 Jōō Jiken) in 1652, abortive plots against Tokugawa rule resulting from the discontent of ronin, samurai who had lost their livelihood due to the extensive escheatment of daimyō in the first half of the seventeenth century. Nobutsuna is also remembered for the innovative techniques of agricultural production he introduced in his 75,000-koku domain in Kawagoe (modern-day Saitama Prefecture), earning him his reputation for great sapience.